Washington, D.C. – Leaders from Parents, Families and Friends of Lesbians and Gays (PFLAG) National expressed their sadness at the passing of Adele Starr, a California mother of a gay son who was PFLAG’s first-ever National President and one of the pivotal figures in the establishment of the national organization. “Adele Starr was one of the pioneers of PFLAG. It is because of her commitment to organizing the many people who were working for the common goal of equality for all into the organization that we now know as PFLAG that we have gained the strength, prominence, and ability to become the voice of parents and allies united for equality,” said Jody M. Huckaby, PFLAG National’s Executive Director. Adele Starr’s involvement with PFLAG started in 1974 when she and her husband, Larry, had dinner with PFLAG founder Jeanne Manford and her husband, Jules. After a year of working to encourage attendance, Starr hosted 35 people in her Los Angeles home. This historic meeting served as the basis for the West Coast organizing for PFLAG. 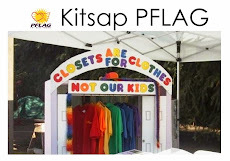 In 1981, 31 representatives from PFLAG-like groups again came together in the Starr’s home for a two-day meeting which resulted in the official founding of PFLAG – then the Federation of Parents and Friends of Lesbians and Gays – as well as the election of its first board of directors. Adele Starr was elected the first-ever PFLAG president. Starr’s den in her Los Angeles home served as the first PFLAG National office, where she managed correspondence, provided leadership for the group which grew to represent more than 250 chapters across the U.S., and organized national conventions to bring members together to build skills and improve PFLAG’s services. It wasn’t until almost a decade later that the organization would outgrow Starr’s den and eventually hire national staff and open an official National Office in Washington, D.C.
Today, PFLAG has more than 200,000 members across the United States, with a vibrant chapter network that provides support, education, and advocacy to those striving for acceptance and justice for all. Starr’s commitment to the organization is widely known, for many through the presentation of the Starr Award, a prize given to a PFLAG leader who has displayed exemplary leadership in their community. “May Adele’s family be comforted at this time of loss by the history she created and with the knowledge that the struggle for LGBT on a national scale began with her,” said Rabbi David M. Horowitz, current National President for PFLAG.